A ride through Picardie in the plus thirties. I started late as I was still trying to plot a route without to many hills. Not to successfully I might add, I have this suspicious feeling that the French canal system would get me through France on the flat! However, the few towpaths I’ve seen have varied in condition from excellent (Aisne canal) to diabolical (Quentin) so more research needed. Plotting a route is very tricky as today I discovered one of the ‘white’ roads had detoriated into a forest track alsio White roads have steeper gradients and the villages are far to twee to have anything like a coop etc. Today was a gruelling 53miles on White roads. Tomorrow it’s Epernay where I might be tempted to take the afternoon off if I can find a suitable hotel. The accomodation and meals are proving to be expensive, currently burning up the best part of £100 per day! (that’s the race Steve, to get to Les Gets before the money runs out) Oh, how I miss Ecuador!! Another cost element is that there is no open wifi here – some ridicolous French law thar makes you liable to jail if someone uses your connection for nefarious purposes – so I’m using the £3 per megabyte O2 rip off cellular rate. Early start tomorrow to beat the sun!! Another long day of over 90 miles with over 1200merres of ascent – yep it’s very hilly and you can only admire those poor sods in WW1 who fought every inch of the way. Every village and every hill has it’s own immaculately kept soldiers cemetry. Anyone who critizes the EU should come and take a look at what occurred in it’s absence. Is it me or is it real that tractors are getting bigger each year? There were truly some monsters out today doing the harvesting – looks a good year for corn. A very thirsty day, drank well over 4 litres of water, juice & beer plus necrarines etc. Top of legs well hurting now, hopefully the pain will gradually go before the big hills! Sally will be pleased to know my legs are now aching….. Lets see how I get on tomorrow! A great day for biking with a nice breeze behind me most of the way. Managed to do 103miles. Which is probably first time since I was 18! Managed to do a nice circular tour from Tower Bridge to Greenwich 🙁 plus discovered the Medway tunnel is not for cyclists! Both events leading to quite a few extra miles and time. Following the GPS track on the Garmin is proving tedious especially on dual carriageways when it’s impossible to do a u turn! The unit seems to take about 50 yards to let you know it’s the wrong way ;-( should ne ok on French minor roads though. 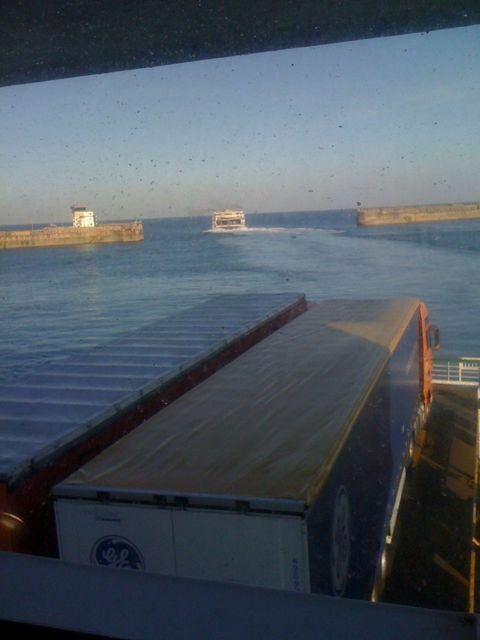 Now on boat to Calais! Hopefully can find a room for tonight!